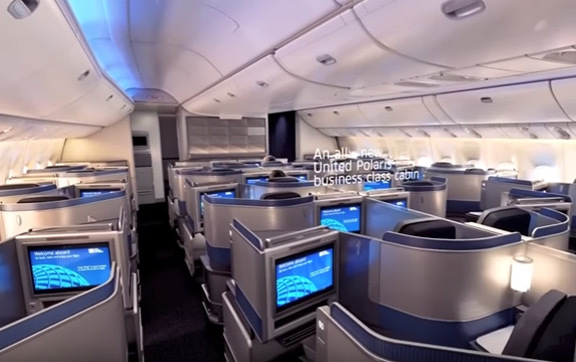 The much-awaited rollout of United’s new United Polaris Business Class has begun with the airline’s ‘soft product’ promising passengers an elevated experience in the sky. The first phase of the international service was launched on December 1, 2016 featuring bedding from Saks Fifth Avenue, Cowshed Spa amenities from Soho House and Co, as well as comfort and dining ‘reimagined’. Focusing on a great night’s sleep in the sky, it is the most drastic product overhaul United has carried out in the last decade with more than 12,000 hours of research going into the final result. Customers can expect improved quality service at every level of premium cabin travel from pre-flight to arrival. 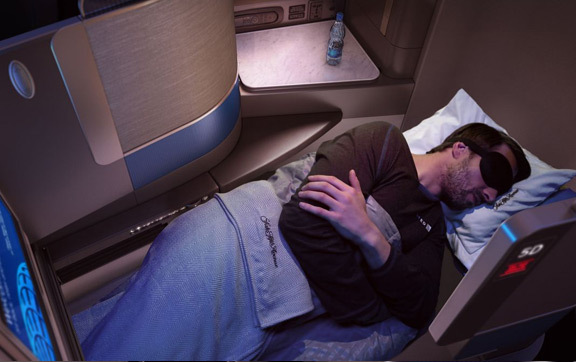 The planned upgrades were first revealed in June and business travellers can now anticipate the new United Polaris offerings across the airline’s entire network which include daily services to Australia’s East Coast. 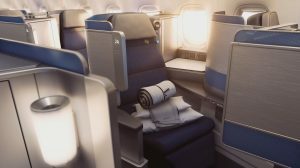 The all-new United Polaris business class seat will debut on the Boeing 777-300ER aircraft, which is expected to commence international operation later this year, before being introduced on the Boeing 787-10 and Airbus A350-1000 aircraft, as well as on the Boeings 767-300 and 777-200 retrofits in the coming years. The new United Polaris seats are made exclusively for the airline and are new to the market. With big names Acumen Design Associates and PriestmanGoode collaborating on the design, and Zodiac Seats United Kingdom in the manufacturing corner, you know the hard product is going to deliver on space and quality. Direct aisle access is a given whilst the forward-facing, suite-like pods provide plenty of room and privacy with a ‘Do Not Disturb’ function hitting the exclusivity theme home. Middle seats will have electronic dividers to offer respite even from your partner (sometimes necessary). The seat itself will unfold to a fully flat six-foot, six-inch bed that’s up to 23 inches wide, with one-touch lumbar support for further comfort. You can expect added storage areas, multipurpose surfaces, and mood-lighting while indulging in hours of screen time with the 16-inch high-definition entertainment system. Ergonomically designed seat that converts to 180 degree flat bed. With the emphasis being on restful sleep, the new United Polaris provides custom bedding and luxury amenities to ensure you arrive at your destination having had the ‘best sleep in the sky’ you’ve ever had. For this, an unprecedented partnership with Saks Fifth Avenue was forged to provide plush quilted duvets if you’re one to feel the cold during a flight, or lightweight throw blankets if not. A cooling gel memory foam pillow can also be requested as can mattress cushions. To keep you relaxed and rejuvenated infight, the new United Polaris Business Class drops another big name, that of Soho House and Co (now they’re just showing off). The Cowshed Spa skincare products from the London-based company features in the amenity kit which also includes ergonomically designed eye shades. Slippers and pyjamas (available on 12-hour or longer flights) complete the on-board sleep experience. 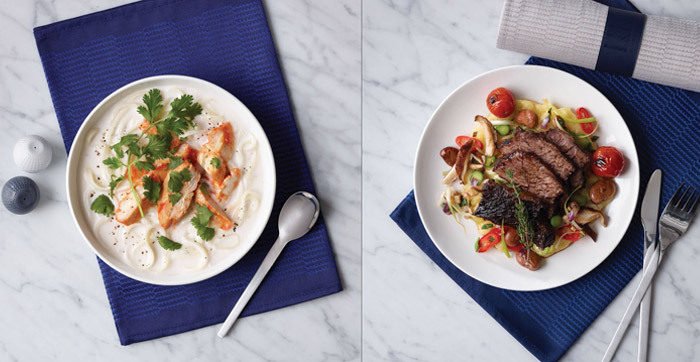 A different take on on-demand dining means you have several options on how you keep your belly happy at 30,000 feet. You can opt for the multicourse ‘experience’ served, as the name suggests, over a number of courses. You can choose to dine in the lounge pre-flight to maximise your sleep on-board, or opt for the Express Dining service where all your choices are presented on one tray in one sitting. If snacking is more your style, you can do so throughout the flight at the walk-up self-serve area. The menus are seasonal and incorporate regional ingredients and flavours devised by recognized chefs such as Bill Kim of Urbanbelly in Chicago, and Jesse Dunford Wood of London-based restaurant, Parlour. A master sommelier has put together the customised wine menu whilst made-to-order signature ice-cream sundaes and desserts will be available. 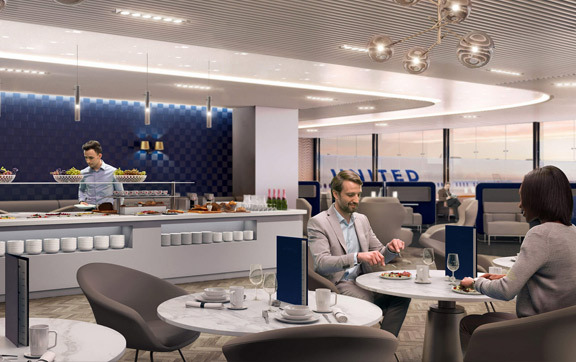 The United Polaris lounges is set to be the prelude to a smooth flight and is the only one of its kind offered by a US carrier. It will set a relaxing scene with tucked away private day beds, custom-designed seating, spa-like showers, soft lighting, and tasteful art. The boutique-style restaurant will offer a menu developed by award-winning chef, Art Smith as well as an extensive buffet of hot and cold selections. The alcoholic beverage selection will feature handcrafted cocktails designed by mixologist, Adam Seger, plus craft brews, premium spirits and specially curated wines. 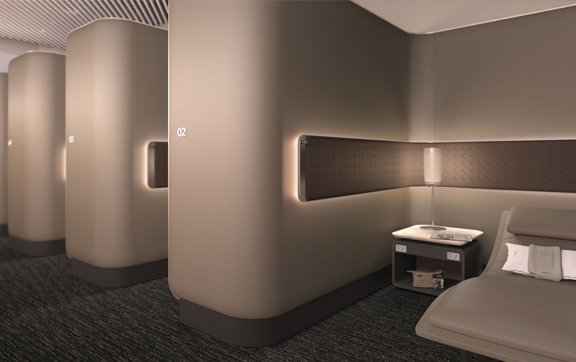 The first United Polaris lounge is now available at Chicago O’Hare and is offered to international business and first class United customers on long haul flights, and to travellers in international business or first cabins on Star Alliance partner airlines on long haul flights. 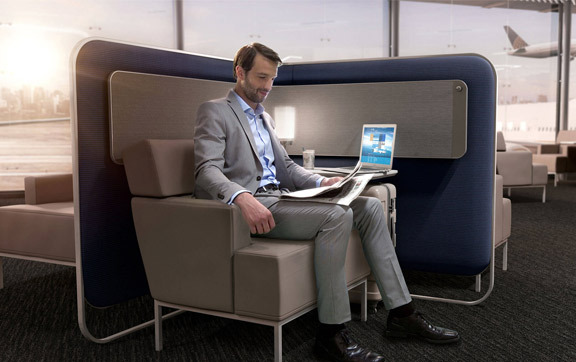 In the coming years, eight other lounges are due to open including Houston Intercontinental, Los Angeles International, New York-Newark, San Francisco, Washington Dulles, Hong Kong, London Heathrow, and Tokyo Narita. Dates for these cities have yet to be announced.